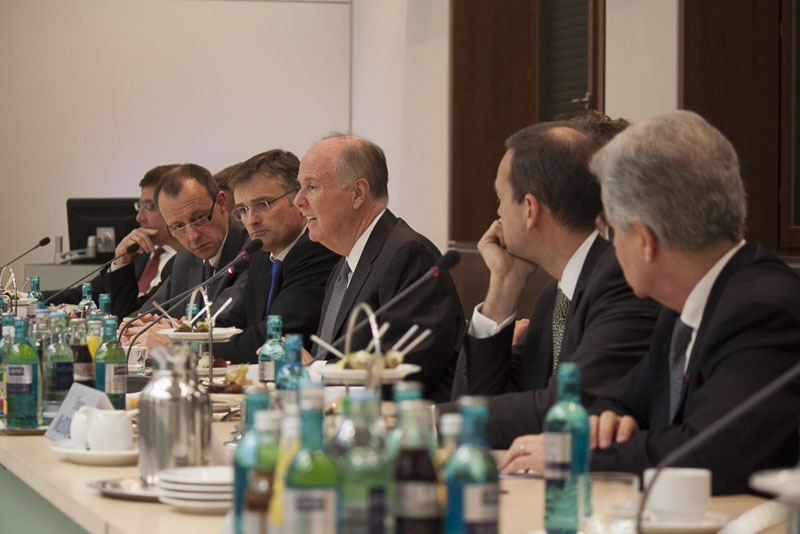 "Mapping Out Security Policy Strategies for the Transatlantic Partnership" - Discussion with Distinguished Security Advisors - Atlantik-Brücke e.V. The panel of the discussion event “Mapping Out Security Policy Strategies for the Transatlantic Partnership” was occupied by distinguished guest speakers, one incumbent and three former Security Advisors. On the 14th of January, Christoph Heusgen, Security Advisor of Federal Chancellor Angela Merkel, Tom Donilon, former Security Advisor of US President Barack Obama, Jean-David Levitte, former French ambassador in the USA and former Security Advisor of President Nicolas Sarkozy, as well as ambassador Simon McDonald, CMG, Ambassador of the United Kingdom in Germany and former Security Advisor of Prime Minister Gordon Brown, spoke in Berlin with a small group of guests about free trade, the American pivot to Asia, the challenges in the Middle East and South East Asia, and the future of the NATO. The debate was moderated by Stefan Kornelius, Head of Department Foreign Policy of the Süddeutsche Zeitung newspaper. Friedrich Merz, Chairman of Atlantik-Brücke, greeted the guests. The panel agreed that the relationship between Europe and the USA is good – Europe and the USA are still the most important partners to one another. Still, the partnership shouldn’t be seen as self-evident. It is always necessary to explore ways how both sides can master new challenges together. An important project in this context is the planned Transatlantic Trade and Investment Partnership (TTIP). It provides a wonderful opportunity for the transatlantic partners to prove their common leadership, by establishing global code of competition. At the same time, TTIP enables both sides to raise their gross domestic product. The coping with the economic and financial crisis in Europe was mentioned as one of the challenges to the transatlantic partnership. Since Europe and the USA are also important economic partners, this is a topic that affects both sides. Another big topic of the debate was the cooperation in the NATO, especially the distribution of financial and material responsibilities. The USA presently has 70% of the NATO budget, the European States 30%. The speakers were in agreement that the unequal distribution is not a good basis for a partnership on equal footing. The division of responsibilities in the common security policy was also discussed. If the USA takes over tasks in which the European partners don’t involve themselves, then these must take matters in and around Europe in their own hands. But the war-weariness, which resides in the people of the nations which participated in the military operations in Iraq and Afghanistan, was also addressed. It was questioned, whether a military intervention would be sensible in every event of a crisis. Furthermore, the panelists discussed that also within Europe there are different priorities for military operations – which became clear through the disagreement about a military operation in the Central African Republic. During the discussion with the invited guests, the surveillance methods of the National Security Agency and the ongoing conversations about a No-Spy Agreement, the role of parliaments in the legitimization of military operations, and the perspectives for pooling and sharing within the NATO were addressed.